A cataract is a clouding of the lens inside the eye which leads to a decrease in vision. It is the most common cause of blindness worldwide and is conventionally treated with SURGERY. Visual loss occurs because opacification of the lens obstructs light from passing and being focused on the retina at the back of the eye. Nuclear sclerosis, the most common type of cataract, involves the central or ‘nuclear’ part of the lens. Over time, this becomes hard or ‘sclerotic’ due to condensation of lens nucleus and deposition of brown pigment within the lens. In advanced stages, it is called brunescent cataract. This type of cataract can present with a shift to nearsightedness and causes problems with distance vision, while reading is less affected. 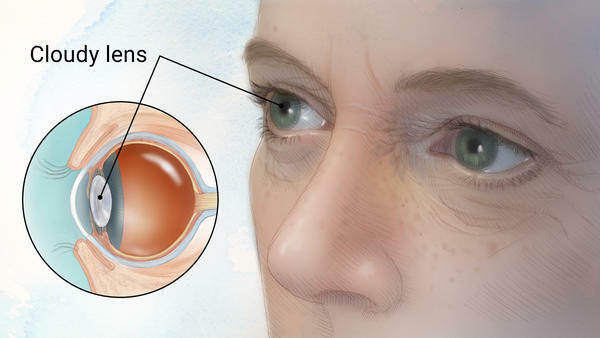 Glaucoma Medication often contribute to formation of cataract.